Ready to be the kind of aggressive, confident FOGO that college teams want at the center X? 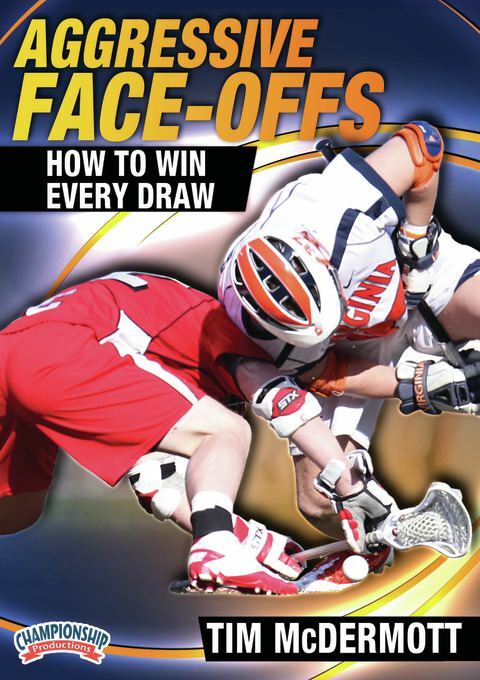 Using on-field demonstrations and a series of insightful game clips, Virginia assistant Tim McDermott dissects the face-off game for players and coaches ready for intermediate to advanced techniques. Coach McDermott gives a detailed and varied presentation that uses live demonstrations and examples of game situations and counter moves. In addition to the specifics at the X, the DVD also covers what to do when the ball is won. By describing each move in detail, you get fantastic insight into the small adjustments that can make big differences. 3.Three challenging drills to simulate the unpredictable situations that often develop during a face-off and reward the players tough enough to adapt, plus a fast-moving "face-off line drill"
4Before- and after-whistle play for the oft-neglected wingmen, and how FOGOs can make the best use of those essential teammates. Coach McDermott closes his presentation by reviewing game film of live face-offs - each broken down into plenty of detail and constant feedback from Coach McDermott on works and what doesn't. You were born to win every draw! Stop settling for 50-50 and go Beast Mode at the center X with the help of this All-American face-off specialist.